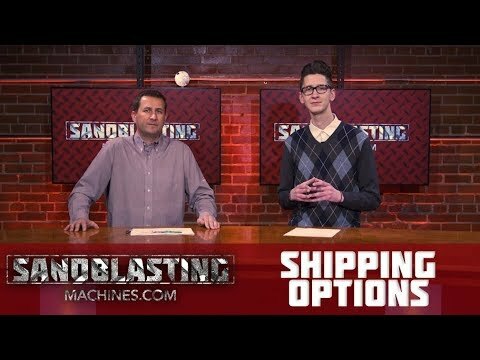 We offer FREE SHIPPING on any order totaling $75.00 (US) or more with SandblastingMachines.com purchases to anywhere in the continental US. If your shipping address resides in the continental United States and you order $75 or more you will not be charged any shipping or handling charges, creating savings opportunities and substantial discount prices online. SandblastingMachines.com, a division of Petroleum Service Company (PSC), can accommodate any order size and is designed for your convenience. Our helpful and knowledgeable team can provide a quote and be your logistics guide. When will my order arrive? See below for UPS Ground shipping estimates from our warehouse in Pennsylvania. For UPS Ground - No Sunday or Holiday delivery. Must order by 1:00 pm EST, Monday - Friday. For 3 Day Delivery-No Sunday or Holiday delivery. Must order by 1:00 pm EST, Monday - Friday. For 2 Day Delivery-No Weekend or Holiday delivery. Must order by 1:00 pm EST, Monday - Friday. A physical address is required. Some restrictions apply. For 1 Day Delivery-No Weekend or Holiday delivery. Must order by 1:00 pm EST, Monday - Friday. A physical address is required. Some restrictions apply. For Freight Delivery - No Weekend or Holiday delivery. Must order by 1:00 pm EST, Monday - Friday. Why do priority-shipping orders sometimes take longer than the designated time period to arrive from date of shipping? Next Day Air orders arrive 1 day after they have been shipped. 2nd Day Air orders arrive 2 days after they have been shipped. 3-Day Select orders arrive 3 days after they have been shipped. An order may not always ship on the same day that it is placed. Placing your order late in the day, after the shipping companies have picked up their last shipment of the day, is one circumstance that may affect overall shipping time. Some orders (i.e. due to size, availability of item, etc.) may also require a longer time to pack and ship than others. As a general guideline, Next Day Air orders may take 1-2 days to arrive, 2nd Day Air orders should be expected within 2-3 days and 3-Day Select orders within 3-4 days. On all priority shipping services, we will attempt to contact you the same business day should your purchase be delayed for any reason.